I want to identify a plant model from input-output data in order to use the identified model to calculate my PID controller values. I’m going to use system identification toolbox of Matlab. SO I’m looking for a way to get open loop step response of the motor using Odrive. I tried to set closed loop control by setting pos_gain , vel_gain and vel_integrator_gain to zeros. But this didn’t work : the motor did not move when we set odrive pid controller gains to zero. 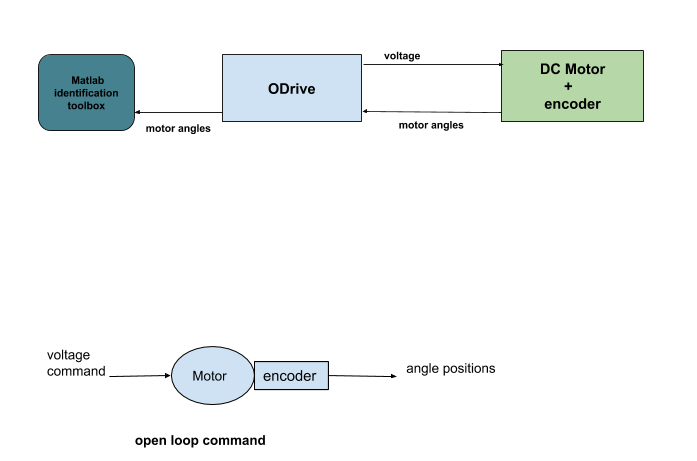 Is there any method to get setp response of my motor using odrive ? Try using the current control mode. To be more clear , I resumed my idea in those diagrams. You can try to use gimbal motor mode, in that case the current setpoint is reinterpreted as voltage instead. Is it okay to do that, even though my motor is not a gimbal motor? I have T motor u8pro with phase resistance measured by odrive around 0.1 Ohm. Is it okay to set it as motor type gimbal?